While malware threats for the Mac may still be limited, there are plenty of other nasties to watch out for online. 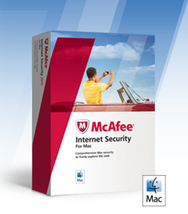 That’s why McAfee has released a pair of its popular protection products for the Mac: McAfee Internet Security and McAfee Family Protection. These products allow Mac users to surf the Web safely. If you’re just looking to keep your own surfing habits from getting you into trouble, McAfee Internet Security can protect you from dangerous Web sites and browser exploits as well as telling you if a particular online shopping site has been checked over by McAfee (unfortunately, McAfee’s Site Advisor, which adds safety markings right inside your browser is only compatible with Firefox at the present time). It can also scan e-mail and IM attachments from Mail and iChat to make sure nobody tries to slip you a mickey while online, and can repair many files without damaging the contents. In addition, a dedicated Secure Search tool allows you to make sure that phishing sites don’t find their way into your results; a two-way firewall keeps an eye on all the traffic entering or leaving your computer as well as locking down outside access to protect from hackers; and all the while McAfee Internet Security can scan for both Windows and Mac malware. McAfee Internet Security runs $80 and covers one Mac for one year—after that, you’ll need to buy a new copy as there's currently no upgrade pricing available. That’s all well and good for your own personal Web surfing, but if you’re more concerned about what your kids might be getting up to, there’s McAfee Family Protection (also available for the iPhone and iPod touch). Not only does it allow parents to filter searches by keyword and prevent access to Websites from 35 different categories of content, but reports provide parents an overview of all the Websites that their kids are visiting. Alerts can be sent to parents via e-mail or text message if a child tries to access a site that’s not appropriate for them. In addition, parents can specify time limits to manage their kids’ Internet use and block the use of specific programs on the Mac. Parents can also remotely modify a child’s profile if necessary. 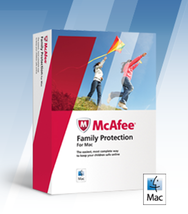 McAfee Family Protection covers up to three Macs for a year for $40. As with Internet Security, you’ll need to shell out for a new copy after that due to any lack of upgrade pricing at present. Both products available now and require Mac OS X 10.5 or later. They also come with a 30-day money-back guarantee and 30 days of free support.